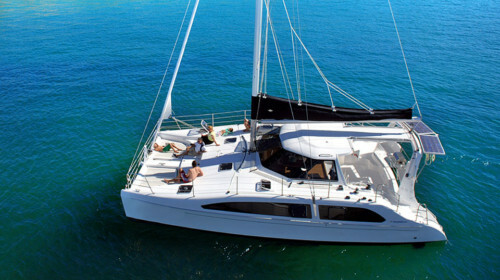 This Fountaine Pajot is available for private yacht charters in Phuket. Boat Rental Phuket with Boat in the Bay: step aboard this luxury sailing catamaran for an amazing private trip to the numerous stunning islands of the Andaman Sea. Make yourself comfortable at the bow area and enjoy the breeze. Onboard accommodation offers 4 en-suite staterooms and 2 comfortable side berths. The salon area is fully air-conditioned. Cooking facilities include BBQ grill for delicious meals on board. This yacht gets fantastic reviews from our customers on a regular basis. She is ideal for cruising under sail but she will perform equally well under power. Perfect for couples, families, and mixed groups. The choice of day sailing destinations aboard this catamaran is unlimited: the famous Phang Nga with its secret caves and majestic rocks, or the crystal clear waters of Racha Islands, or the world famous Phi Phi Islands, or Krabi area. Our beautiful Fountaine Pajot Catamaran can cover any of them, with unmatched comfort and attentive attitude of the professional crew. Contact Boat in the Bay today to inquire about your private trip on this Fountaine Pajot 48 and other boat rental options in Phuket. Surcharge to Phi Phi Islands, Racha Islands, Krabi: 15,000 THB. Day charters to these destinations take 12 hours starting at 8 am and finishing at 20 pm.